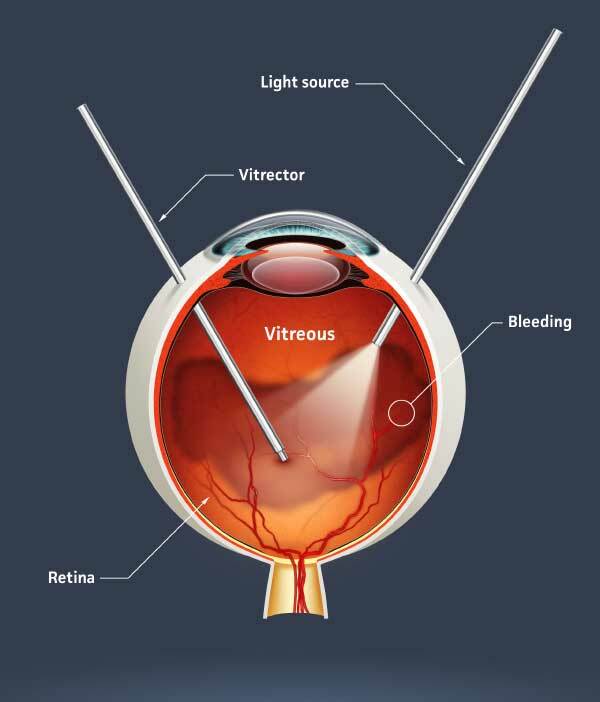 Retina Specialists Seattle, Retina Doctor Seattle, Opthalmologist Seattle || Retina Specialists Northwest - Vitrectomy is the main surgical procedure used for treatment of visually debilitating vitreoretinal diseases. Vitrectomy is the main surgical procedure used for treatment of visually debilitating vitreoretinal diseases. Vitrectomy involves using microinstruments to enter the eye at the safe-zone, called the pars plana, that’s located a few millimeters behind the limbus, the area where the colored portion meets the white (conjunctiva) of the eye. The instruments are fine needles or cannulas that are specialized to deliver light, fluid, and to safely cut the vitreous strands. Vitrectomy involves the microsurgical cutting and removal of the vitreous gel while simultaneously infusing fluid especially formulated for compatibility to the eye. This allows the surgeon to examine and repair the damaged retina. The surgeon with the assistance of trained specialized staff uses a microscope designed to view the back and front of the eye. The surgery itself can last 20 minutes to 4 hours depending on the complexity of the disease. Most surgeries can be safely performed under local anesthesia with a little sedative but sometimes it’s in the best interest of the patient to be asleep under general anesthesia. This is most commonly the case when there is anxiety, claustrophobia, back or neck pain, and for unusually long and complicated cases. Another retinal surgery performed in the hospital is a scleral buckle that is used to repair some types of retinal detachments. It used to be the primary means of retinal detachment repair but is now employed far less often because of recent technological advances in vitrectomy. Scleral buckling involves placing a silicone band around the eye underneath the conjunctiva to indent the eye wall thereby providing support to the retina. It is almost always used in conjunction with laser or cryo (freezing) therapy to permanently repair the retinal detachment. The band or buckle can remain in place for a lifetime and is invisible to the non-physician. The surgery often requires the patient to be asleep or nearly so to tolerate the surgical procedure which takes 30 minutes or longer.